A satellite to broadcast television across a swath of the globe from Israel to New Zealand launched on top of a Russian Proton rocket Friday, successfully starting a 15-year mission for AsiaSat of Hong Kong. 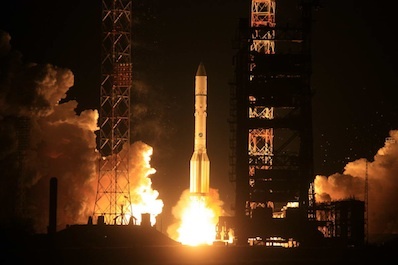 The AsiaSat 7 satellite was boosted into space on top of a Proton rocket, which lifted off at 1910 GMT (2:10 p.m. EST) Friday from the Baikonur Cosmodrome in Kazakhstan. More than nine hours later, at 0423 GMT (11:23 p.m. EST), the rocket's Breeze M upper stage deployed the 8,406-pound satellite in a lofty orbit stretching between 8,583 miles and 22,112 miles above Earth. International Launch Services, the U.S.-based firm which sells Proton rockets commercially, declared the mission a success. "This is our second launch with AsiaSat in just about two years, when we launched the AsiaSat 5 satellite," said Frank McKenna, president of ILS. "With this ILS Proton launch of AsiaSat 7, we have again played a pivotal role in AsiaSat's strategic plan for the expansion of their business with our unmatched schedule assurance." 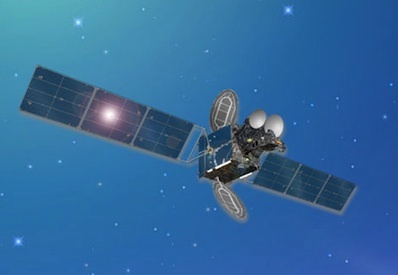 AsiaSat 7's on-board propulsion system will circularize its orbit approximately 22,300 miles over the equator, where it will be stationed at 105.5 degrees east longitude. "With the launch of AsiaSat 7 on the powerful ILS Proton vehicle, AsiaSat will be able to deliver on our promise to provide high quality and uninterrupted service to our current and potential new customers across Asia, Middle East, and Australasia," said William Wade, president and CEO of AsiaSat. "Our selection of ILS Proton, providing optimized delivery to orbit, will help extend the lifetime of the satellite, creating exceptional value for our business." AsiaSat 7 will replace the AsiaSat 3S spacecraft, which launched in 1999 and is approaching the end of its life. The fresh satellite will beam C-band, Ku-band and Ka-band signals to customers across the Asia-Pacific region, according to AsiaSat. "With AsiaSat 7 successfully launched well ahead of the planned date for AsiaSat 3S's replacement, we can assure continuity of service to customers, while at the same time adding to our on-orbit capacity to service new business," Wade said in a statement. AsiaSat 7's C-band beam covers more than 50 countries, while four Ku-band beams will focus on South Asia and East Asia, the company said. "We hope this launch will bring added capacity and more reliable capacity to their customers for the continued growth of their networks and their businesses," said Zhang Hai Ming, AsiaSat's vice president of marketing for China. Built by Space Systems/Loral of Palo Alto, Calif., AsiaSat 7 will support television broadcasting and VSAT networks in its coverage zone.